Who Had A Season With WAR ≥ 10 But Is Not In The Hall Of Fame? The table below shows all the position players who had at least one season of WAR 10 or higher (from Baseball Reference). Of all the players who are eligible, the only one not in the Hall is Norm Cash. Now it might seem like his 1961 season when he batted .361, hit 41 HRs, drew 132 walks had a .487 OBP and a .662 SLG was the flukiest season ever. He never batted .300 again (his last year was 1974) nor did he ever reach 40 HRs or 100 RBIs. He never reached a .400 OBP again or a .600 SLG (he only reached .500 3 more times-he was pretty much a full-time player until 1973). But his 1961 season was not the flukiest. I have written about this before. See Which Players Had The Most Uncharacteristically Good Seasons? Cash had the 25th flukiest season. It will be interesting to see what happens with the voting for some of these other guys. Bonds, Giambi, Sosa and AROD might be penalized by some voters for using PEDs. Pujols should get in easily. It is probably too early to tell for Kemp. But Beltre is interesting. His yearly performance has been inconsistent. But he now has 47.6 WAR and he will be 33 starting next year. He is 189th in career WAR among position players but if he could get up to about 62, he would be in the top 100. His last two years were 6.1 and 5.2, so another 14.4 seems possible. Being in the top 100 would make him a legitimate candidate. Now a WAR of 10 gives an edge to guys who played after 1961, when the season went to 162 games (in the AL, 1962 in the NL). So I looked for guys who had 9.5 or more before then (covering about the 5% difference in games from a 154 game season). There were a total of 82 seasons of WAR ≥ 10 and another 21 ≥ 9.5 before the 162 game season came in. Of the guys in that group who are not in the Hall of Fame we have George Stone (9.8, 1906), Joe Jackson (9.5, 1912), and Al Rosen (9.7, 1953, the year he missed the triple crown by losing the batting title to Mickey Vernon, .337-.336). "After his great initial success, Stone held out for $5,000 to start the 1907 campaign. In order to make sure that team owner Robert Hedges met his demands, Stone did not report to the team until right before the start of the season. The holdout, as one publication put it, "seems to have been the turning point of his career." On one level, "the papers aired the case and naturally by some Stone was censured for what was termed unreasonable demands." Moreover, "when he was finally granted the amount he asked, the fans figured that a player getting such big money should never fail to deliver the goods. Any time Stone failed, and unfortunately for him he had a rather tough year in 1908, he was roasted to a turn by the fans. Stone began to show signs of slowing up that year." Stone's statistics fell off in both 1907 and 1908, though he was still an outstanding hitter. One account indicates that he contracted malaria in 1908, and Stone's production plummeted in 1909 when he suffered an injury to his ankle. That injury cost Stone his speed, which had enabled him to beat out many infield hits. He also had problems with his arm, and "any time a ball was hit into his territory the opposing base runners advanced almost at will. The worry over all these things caused Stone's batting to suffer and as a result the sensation of the American League of 1906 was a near joke in 1910." Stone never hit higher than .300 after 1907, and his average fell to .256 in 1910, his last season in the major leagues. Stone returned to the Milwaukee Brewers in 1911, batting .282, but injuries led him to retire from professional baseball just 12 games into the 1912 campaign." Why Didn't The Writers Vote Johnny Mize Into The Hall Of Fame? He got in, via the Veterans Committee, in 1981. So it might seem a little late and silly to complain about it. But he never he even got 50% of the vote from the writers (he topped out at 43.6% of the vote in 1971 and he got 41.3% in 1973, his last year of eligibility). If we went strictly by WAR, it seems like he should definitely be in. Even now, about 50 years from when he first became eligible, he is 55th in career WAR among position players with 70.2. He had 8 top 5 finishes and one first place. He was in the top 5 each year from 1937-40. So he had very high career value and peak value. In Win Shares, he also had 8 top 5 finishes among position players, including 3 first places finishes. He was 104th through 2001 in career Win Shares (338) including pitchers. He also missed 3 seasons due to WW II. Bill James ranked him as the 6th best 1B man in the 2nd Historical Abstract. We certainly cannot fault the writers in the 1960s and 1970s for not being up on sabermetrics. He did seem to have very good conventional stats, though. He hit 359 HRs and easily would have made 400 if not for the war (he was 10th in career HRs through 1960, his first year of eligibility). He had a .312 career average. He lead the NL in HRs 4 times, RBIs 3 times and AVG once. He was selected to 10 all-star teams. The writers seemed to like him when he played. He had 4 top 5 finishes in the MVP voting and even now he is 57th in MVP shares with 2.46 (of course, there was not much MVP voting before 1931, but that is still a pretty good rank). If a guy was the 57th best player since 1931, that would be a good case for being in. So why didn't the writers vote him in, never reaching 50% of the vote? His bio at SABR by Jerry Grillo has one interesting quote: "Broeg and others have indicated that Mize’s defensive liabilities probably cost him..." Yet his career defensive WAR is a positive 2.6. He also finished in the top 3 in fielding Win Shares 7 times among NL 1B men (and 1st in 1948). Bill James gave him a B as a fielder. The SABR bio mentions that he got his nickname "The Big Cat" due to his fielding, scooping out bad throws. "For a player with such notable sabermetric statistics, he was also quite late in being inducted into the Hall of Fame, finally being chosen by the Veteran's Committee 28 years after his retirement, in 1981. There are at least two possible explanations for this. One, during his playing years, he apparently did not enjoy particularly good relations with the baseball sportswriters, from whose ranks are chosen those members who vote on candidates for the Hall of Fame. Two, his power, his fine batting average, and his extremely good On-Base Percentage were not as evident to his contemporaries, who were more impressed by Ted Williams, Joe DiMaggio, and Stan Musial, as they are today in the light of sabermetric analysis. Another couple reasons are quite powerful, too. First, his lifetime stats are not very impressive compared to most Hall of Famers - he barely had 2,000 hits, he had 359 home runs (currently # 65 on the all-time list as of 2006, one below Gary Gaetti), and he had 1,337 RBI (currently # 76 on the all-time list as of 2006, four below Gary Gaetti). Second, he played in his early years in a ballpark that favored hitters. So he was a top-notch player, but one that didn't put up numbers as large as most Hall of Famers. Since he missed three years to World War II, the Hall of Fame rightfully adjusted for the numbers." I don't know anything about his relationship with the writers. But as I mentioned earlier, he did well in the MVP voting (a point Bill James has made about Ted Williams). On the park effects, those are taken into account in WAR and Win Shares. Now it is possible that park effects are not always fair to individual hitters. It was only 250 feet down the line in the Polo Grounds. Yet the park factors for the Giants in the years Mize was on them are pretty neutral. Click here to see them at Baseball Reference. So maybe his hitting stats don't get adjusted downwards as much as they should. So a big split, but not that bad. His road stats are very good. Again, the writers might not have had access to this, but it seems like there should have been a general sense that he hit well everywhere, given that these guys watched him play all the time. In fact, if we only used his road OPS, it would be the 37th highest of all-time through 2009 (relative to the league average) of players with 5000+ PAs (using the Lee Sinins Complete Baseball Encyclopedia). His road OPS was about 25% higher than the league average. He is 9th among 1B men (guys who played at least 50% of their games there). One of the guys ahead of him is Todd Helton, who benefited even more from his home park. In his first year of eligibility, 1960, he got only 16.7% of the vote. Click here to see the voting that year at Baseball Reference. Twelve guys got more votes than he did that year and he had more WAR than all of them. He beat 8 of them buy 20 or more WAR. Edd Roush, Sam Rice and Eppa Rixy all got over 50% of the vote that year, a level Mize never achieved. None of them had even 52 WAR (Mize had 70.2). All but one of the 12 got in before Mize (except Lazzeri). Most were by the Veterans Committee. So they too, did not give Mize the credit he deserved. I think the writers, and to a lesser extent the Veterans Committee, did a poor job in evaluating Mize. I hope the writers have been, and are getting, better. But when I see the voting for guys like Raines and Bagwell, not to mention Lou Whitaker being gone after just one year on the ballot, I am not sure. From 1984-86, Mattingly had an OPS+ of 158. From 1988-90, McGriff had an OPS+ of 159. McGriff’s 1988-91 OPS+ of 156 also beats Mattingly’s 1984-87 OPS+ of 155. But in WAR, Mattingly is ahead over three years 19.6-16 and ahead over 4 years 25.3-20.6. Over the 4 years Mattingly had 0.7 more defensive WAR, so that is only a small part of the difference, meaning Mattingly’s offensive WAR advantage was 4.0. He had about 157 more PAs. It does not seem like that would give him an edge of 4.0. I can’t tell what accounts for it. 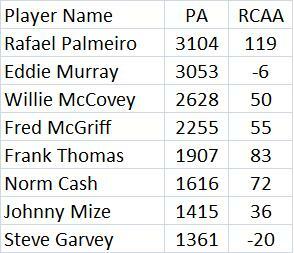 I also found Mattingly’s best 4 year period for Win Shares was 14 better than McGriff’s (122-108). Mattingly had 2.3 more fielding Win Shares, so most of the difference is due to hitting. Again, when their OPS+ is so close, this is surprising. How Well Might Pujols Hit After Age 35? The first thing I tried to do was create a set of comparables. So I found all the 1B men who had 4000+ PAs before the age of 32 since 1920 who also had a relative slugging percentage of 120 or higher (that means their SLG was 20% better than the league average-I used the Lee Sinins Complete Baseball Encyclopedia). These guys had to have played at least half their games at 1B. I also included any DHs that fit (that added in Frank Thomas). So I was trying to set up a group of power-hitting 1B men to use in comparison. I went up through 2009. If we assume a full season is 700 PAs, then none of these guys reached even five full seasons after the age of 35 and only two reached four full seasons (although you could argue that McCovey and McGriff are also at 4+ full seasons if you use 500+ PAs). But that means out of the 32 comparable players, only 4 could be said to have played at least 4 full seasons after the age of 35 and Pujols has a contract calling for 6 seasons after 35. Now the best performer here seems to be Palmeiro. We don't know how much of his performance was due to drugs. Again using the 700 PA for a full season, he gets 4.43 seasons. If we assume a -2 wins below average for a replacement player, that gets him 8.86 WAR. Then if we assume about 10 runs per win, his RCAA gets us about 12 wins. 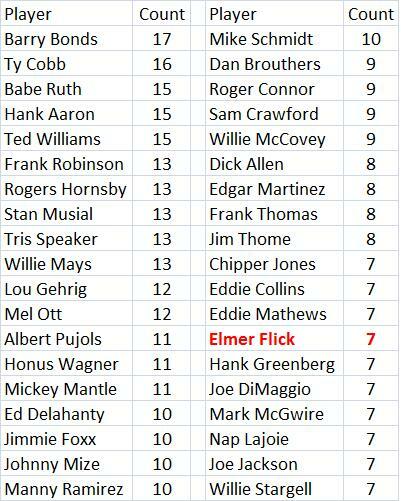 Then we are at about 21 WAR for Palmeiro as the best performer among Pujols' comparables (of course, I am assuming no negative WAR from defense). Of course, Pujols is better than the average of these guys. This group collectively had only about 38% as many PAs post-35 than pre-32 and their average RCAA per PA fell from about .069 to about .022 (I added 1000 PAs and an RCAA of 100 to Mize for ages 30 and 31 which were missed due to the War). That means that Pujols, if this goup is an indicator, will get 2846 PAs after age 35 and get about .0338 RCAA per PA (he has average about .10 RCAA per PA so far in his career (I estimated his RCAA for the last two years since I don't have the latest Sinins data yet). I assumed that Pujols' dropoff in RCAA per PA will be the same as this group. So he would get about 96 total RCAA. So that is 9.6 wins. Then he gets about 4 full seasons so we had another 8 wins, again assuming -2 wins is replacement. So that would be 17.6 WAR for Pujols after age 35 (again assuming no negative defensive WAR). Remember that he has 6 contract years at $25 million a year. So the Angels will be paying $150 million for 17.6 WAR or $8.5 million per WAR. Maybe with inflation, a championship or two and extra ticket sales that might be worth it. I assume Helton will get past the 1000 PA mark. So combining this group with the others would mean that we have 11 out of 35 of the comparables getting at least 1000 PAs. I don't have their RCAA for the last two years and I don't know how much more they will play but my guess is that if I added them to the other 8 guys and re-did the analysis it would not change things much. One thing to remember though is that Pujols is a very unusual player. He started playing full-time at age 21 and in 11 seasons has not missed many games. Only 20 players since 1920 had more PAs under the age of 32 than he did and only 3 had more WAR. So maybe looking at other power-hitting 1B men is not the way to go. One interesting thing here is that some other all-time great 1B men did very little after the age of 35. That includes Gehrig, Foxx and Greenberg. But perhaps each of them has highly unique reasons for not aging well that won't necessarily apply to Pujols. Gehrig had ALS, Foxx was a drinker and Greenberg had the chance to move into the front office. So the last thing I will do here is compare Pujols to all the players who had 6500+ PAs since 1920 under the age of 32. Through this year, there were 65 players in this group (I took out some guys who are still active and are not yet 36-see list below). Of these 65, 23 had at least 1000 PAs after the age of 35 (that includes Jeter and Damon who might keep getting more PAs). So just about one-third of these comparables ended up with at least 1000 post 35 PAs. That is similar to what I found for the power hitting 1B men. They got about 33% as many PAs post 35 as pre-32 and about 17% of the WAR. If Pujols gets 17% as much WAR, he will get about 15.4 WAR after age 35. Maybe 16 if Damon and Jeter are taken out. The PA minimum was 400. Here is the list of those 38 players. 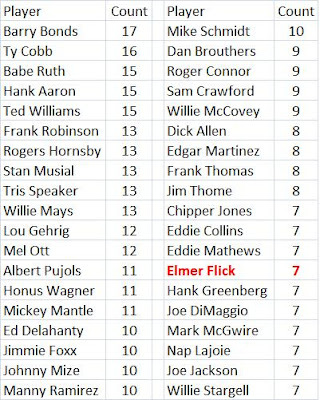 I highlighted Elmer Flick because he is the answer (or maybe an answer) to a trivia question: name a player who led the NL in RBI's and later went on to lead the AL in SBs. I don't think there are any others but I am not sure. Flick was finally voted into the Hall of Fame in 1963 by the Veterans Committee. He was 87 but luckily still alive. He only got 0.4% of the vote from the writers in 1938 and that was it. In an 8 year period he had 7 top 10 finishes in WAR among position players including 5 in the top 5. Even now he ranks pretty high in career WAR (133rd) with 56.7. Through 1938, he was 36th. He had 9 top 10 finishes in OPS+ including 6 top 5 finishes and a first. "Despite his short but highly productive career in the majors, Flick remained largely forgotten by the baseball community in general and the Hall of Fame voters in particular until Ty Cobb's death in 1961. Some articles written about the Georgia Peach mentioned the aborted 1907 trade and thus revived interest in who Flick was and what made him worthy of being suggested in a trade for Cobb. The renewed attention, in turn, led to Flick being voted into the Hall of Fame by the Veterans Committee in 1963, an honor he treasured until he died from congestive heart failure at 8:25 A.M. on January 9, 1971, only two days before his 95th birthday. Flick also suffered from mycosis fungoides, a malignant lymphoma, which contributed to his death." I used some voting formulas I had come up with and it seemed like Santo just did not have the kinds of stats and accomplishments that the voters (writers) liked. I showed that he didn't. Sometimes our advanced sabermetric stats might be a little mis-leading since we compare players to the league average at his position during his time period. If Santo had been up against many weak 3B men, that could make his value look greater. But I don't think that is what happened. I showed that although he hit much better in Wrigley Field than elsewhere he was still very valuable in road games (his career OPS in home games was .905 while it was .748 on the road-this includes the 117 game season for the White Sox in 1974). This was based on the run environment of his era, which was generally low. So although his road stats don't look like much, they were highly valuable. I looked at various sabermetric measures. If we was not the best, he was close. I showed that Santo's performance compared favorably to Robinson even though Robinson did much better in the voting. I showed that Santo's performance from 1965-67 might have been tied for the 24th best 3-year run in baseball history.